Bell P-63 Kingcobra 1. P-63C-5-BE "Delma X" Serial: 43-11344 'Delma X' inscription painted by American mechanic. 2. 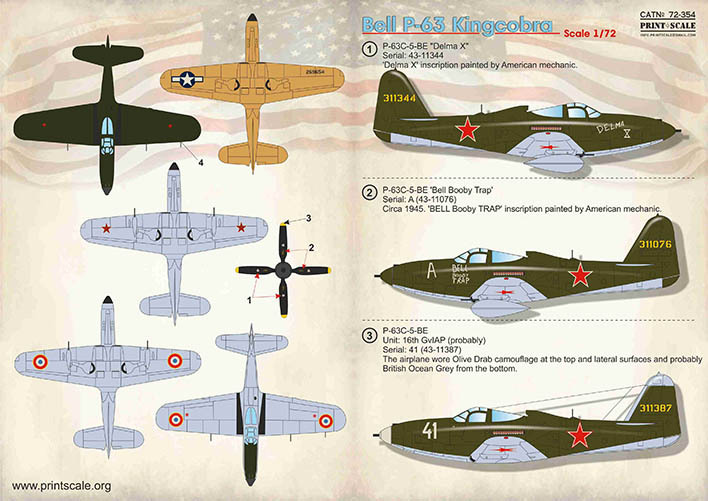 P-63C-5-BE 'Bell Booby Trap' Serial: A (43-11076) Circa 1945. 'BELL Booby TRAP' inscription painted by American mechanic. 3. P-63C-5-BE Unit: 16th GvIAP (probably). Serial: 41 (43-11387). The airplane wore Olive Drab camouflage at the top and lateral surfaces and probably British Ocean Grey from the bottom. 4. P-63C-5-BE Unit: GC 2/5 "Ile de France", Armee de l'Air. Serial: 5T-B (43-11691). French Indochina, year 1949-1950. 5. P-63C-5-BE. Unit: 5 Escadre de Chasse, Armee de l'Air. Serial: S (43-11666). La Reghaia, Algeria, circa 1946. 6. RP-63A-11-BE "Pinball Do Not Tilt". Serial: 42-69654. 2126th Base Unit Laredo Texas. 7. P-63C-5-BE Code: E; (43-11697). Unit: 2 Escadrille, GC I/5 'Vendee'; Tan Son Nhut, Indochina, circa 1949. 8. P-63C-5-BE. Unit: GC 2/9 "Auvergne", Armee de l'Air. Serial: 44-4037 Le Vallon, France, 1946. 9. P-63C-5-BE. Unit: 1 Escadrille, GC 1/9 "Limousin", Armee de l'Air. Serial: 43-11683. Cat-Bi, French Indochina, 1951. 10. P-63C-5-BE. Unit: GC I/5 "Travail", Armee de l'Air. Serial: 5T (43-11599) Sidi-Ahmed, Tunisia, 1947.